RESPONSIBILITIES – Hikers with children under 16 and new hikers are required to contact the hike leader in advance to determine if the hike is suitable for them. Minors under 16 are welcome on day hikes when accompanied by a parent or guardian. No person under 18 shall participate in overnight outings unless accompanied by a parent or adult sponsor over 21. The hike leader may refuse to allow a person to hike who is judged to be poorly equipped or unable to do the published hike. Pets are not permitted on hikes unless the hike description clearly states that it is “dog friendly”. 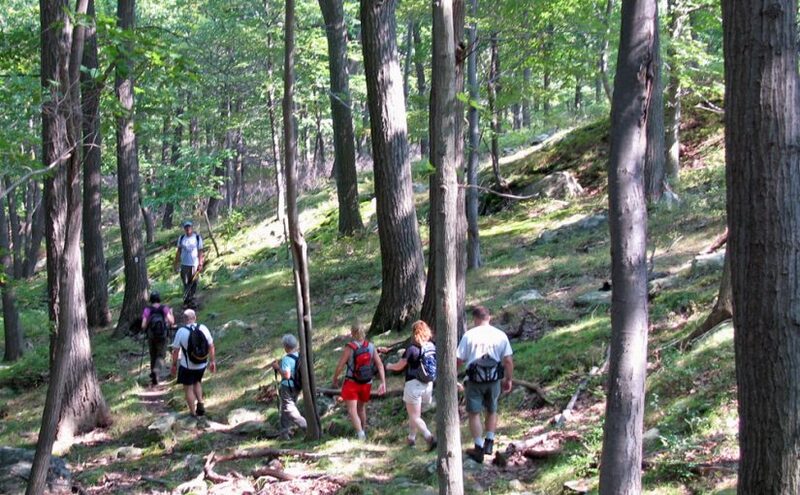 Non- members are welcome on two hikes after which ADK membership is required. Participants should get to the hike at least 10 minutes prior to the starting time. RISKS – As with all physical activities, hiking involves hazards. Persons participate at their own risk and will be asked to sign a statement acknowledging that fact before starting the hike. Prior to the hike please advise the leader of any medical condition or physical liability that could affect you during the hike. FOOTWEAR AND CLOTHING – Wear clothing suited to the weather and carry extra garments for unexpected weather conditions. Dress in thin layers so that you can adjust the number of layers as required to maintain comfort. In winter carry a wool cap and wool or polypropylene gloves or mittens and a windproof shell. Be prepared for rain. Bring a rain jacket and rain pants, preferably of the type that permits venting body moisture. Wear comfortable, sturdy boots. Do not wear cotton garments in winter. DRINK AND FOOD – Adequate hydration is important year round. Drink frequently during the hike. Carry food to enjoy during the midday lunch stop. DOG-FRIENDLY HIKES – Dogs are not welcome unless the hike is designated as dog friendly in the schedule. All hikers with dogs must abide by park leash regulations. HIKE RATINGS – represent the Pace, Distance and Terrain covered during the hike. A hike’s rating is determined by the hike leader. TERRAIN: A – Strenuous, long ups and downs, some rock scrambling possible. B – Moderate ups and downs as occur typically in Harriman. C – Generally flat with little elevation change. MAPS – The TC number indicates a NY-NJ Trail Conference map for the area of the hike. For example: TC-118 refers to the Southern Harriman Park map. ABBREVIATIONS – NCA-No Calls After . . . , Pref.- Leader’s contact preference. EXPENSE SHARING – When car-pooling, passengers are expected to offer the driver funds sufficient to cover the cost of fuel, tolls and parking fees. A $3.00 minimum per person is recommended. Most hike trailhead meeting locations can be found on NY-NJ Trail Conference maps. can be found then the leader or a substitute should appear at the hike meeting place to inform hikers of the situation. If a qualified leader volunteers, he/she should be given the sign-in sheet and the hike can proceed as scheduled. If the hike is one that requires preregistration, the leader must inform all who registered of the change by phone or e-mail.